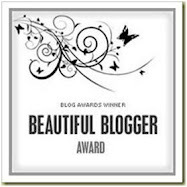 A big thanks to Kasey for nominating me for the Beautiful Blogger Award! Apparently, I have to share 7 Random Facts about Myself, then nominate 7 new lovely bloggers, so here goes. 1. I have a severe phobia of going to the ophthalmologist. I can’t stand anyone coming near my eyes, let alone putting anything in them. I’ve always been this way – haven’t had an eye exam in 12 years. This in itself is weird, but couple that with the fact that I dated an ophthalmologist for 3 years. 2. I love to dance. Any type, any time, ballroom dance, hip hop, jazz, etc. I was in dance line in high school and loved it. Would have loved to be a Rockette! 3. When I was a kid, I was a VERY picky eater. I pretty much lived on fish sticks, hamburgers, and cereal. I refused most vegetables, fish, Mexican, Asian or any other ethnic food for that matter. I grew to love EVERYTHING when I went away to college and then my internship. 4. I grew up in Minnesota. The last winter that I lived there, the whole month of January was below zero degrees. I will never again live anywhere with that much snow and cold. That said, I love to visit there, and it will aways be home. 5. I love makeup. Although I don’t tend to wear that much, I could hoard it. One of my favorite jobs was working at the Lancome and Clinique counters while in college. I could spend hours in Sephora. I want it all! 7. My favorite TV show is Damages. Can’t wait for the season to start up again. Second favorite - CSI Miami. Love your 7 facts! I can't even imagine a winter that cold. Oh, and I am a fellow CSI fan! Thanks!!! I Love CSI too!